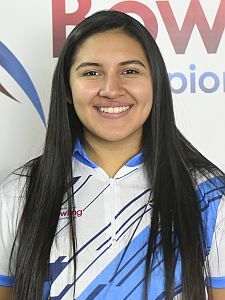 The inaugural World Junior Bowling Championships got underway Monday morning, March 18, with the Official Practice, before the event kicked off officially with the Opening Ceremonies, which were followed by Boys and Girls Singles Squad A. 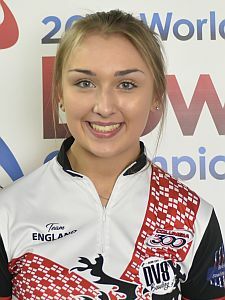 The 106 athletes age 18 and under from 34 countries, 59 boys and 47 girls, were split into two squads (A and B) to bowl six games of preliminaries on the 41-foot Montreal pattern over two days, Squad A on Monday and Squad B on Tuesday. 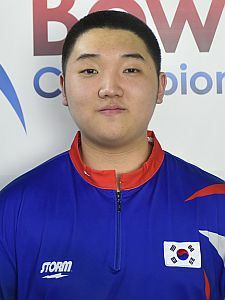 Ji Geun (right) of South Korea averaged 252.67 over six games to take a dominating lead in the boys’ division with 1,516 total. Ji started his series with 277 and 278 and never looked back. He closed with 225, 224, 235 and another 277 to out average his nearest competitor by 20 pins. Trailing the Korean by 120 pins to sit in second place was Hugo Bonnefoy (left) from the host country France. 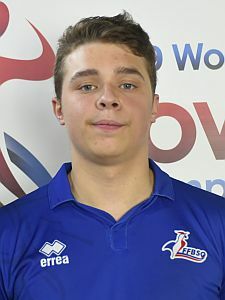 Bonnefoy rebounded from a slow start (188) with 257, 232, 265, 198 and 256 for 1,396. Third place belonged to Ji’s compatriot Park Donghyuk (right), who used six games between 267 and 201 for 1,393. Rounding out the top 4 was Mykola Sielin (left) of Ukraine, also with 1,393, including a high game of 266. The tie was broken by the highest game in that event. 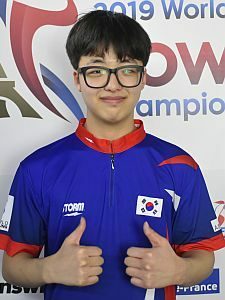 Since this is the first edition of the World Junior Bowling Championships, Geun set new records for three games (780) and six games (1,516). 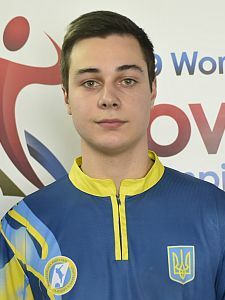 Artemijs Hudjakovs of Latvia bowled the highest game of the event so far with 279. He finished just 17 pins short of the top 4 in sixth place with 1,376. Victoria Kashirskaya (right) of Russia and England’s Isabel Allen were tied after four games at 916. 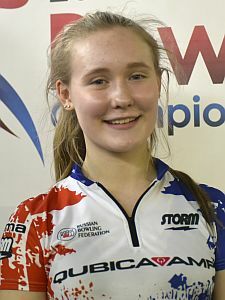 Kashirskaya, who started with 277 and 253 before suffering two games under 200 (198 and 188), closed with 245 and 199 to take the early lead in the girls’ division with 1,360 and an average of 226.67. Allen followed games of 253, 232, 200 and 231 with 221 and 195 to take second place with 1,332. 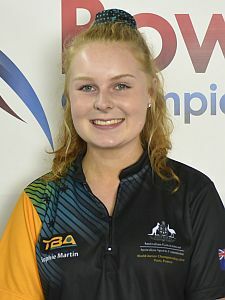 Sophie Martin (below right) of Australia was mere 16 pins back in third place with 1,316, including a high game of 253. Sofia Sanchez (below left) of Guam was the last athlete who surpassed the 1,300 mark to sit on the bubble in fourth place with 1,307. Kashirskaya owns all three records in the girls’ division over 1 game (277), 3 games (728) and six games (1.380). The top 4 athletes in each division have to sit and wait for the results of B Squad, while all other players are already out of the medals. 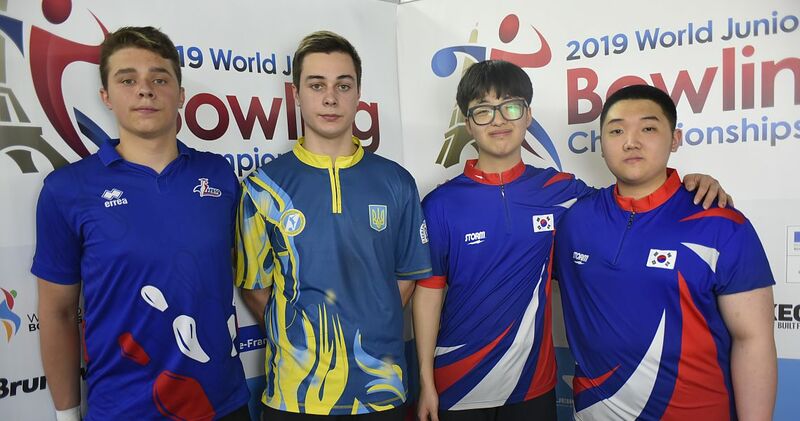 The young athletes at the 1st World Junior Bowling Championships compete for medals in five disciplines – singles, doubles, mixed team, all-events and masters from March 18-24. 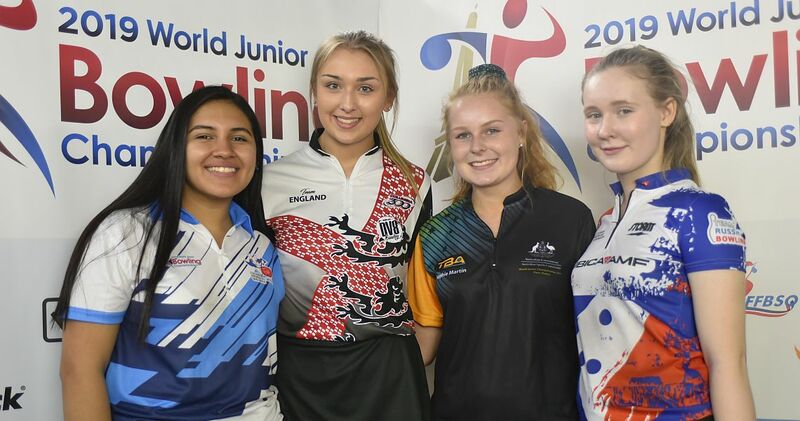 For more information about the 2019 World Junior Championships, visit https://2019wjc.worldbowling.org/.